September 23, 2015 – MILLINGTON, Tenn. (NNS) — MILLINGTON, Tenn. – Command Pass Coordinators (CPC) are the vital link between Sailors, Commands and Personnel Support Detachments (PSD), but accurate records begin and end with the individual service member, Navy leaders said recently. The Navy Standard Integrated Personnel System (NSIPS) is the Navy’s single, field-entry, electronic pay and personnel system for all active and Reserve Sailors, but when NSIPS electronic service record doesn’t provide the information or data needed, visit the CPC for help in getting questions answered. 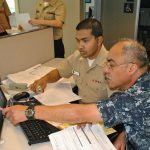 The Pay and Personnel Administrative Support System (PASS) program has created more than 30 standard operating procedures (SOP) to help Sailors perform their day-to-day personnel activities like travel claims and updating records. The SOPs are accessed through the Manpower, Personnel, Training and Education (MPT&E) intranet on any command access card-enabled computer.